A spinet is a small, wing-shaped keyboard instrument that plays like a harpsichord. It was developed in Italy during the 1630s and first appeared in England during the 1660s. The instruments made by John Player, a London builder, are amongst the earliest surviving English examples. 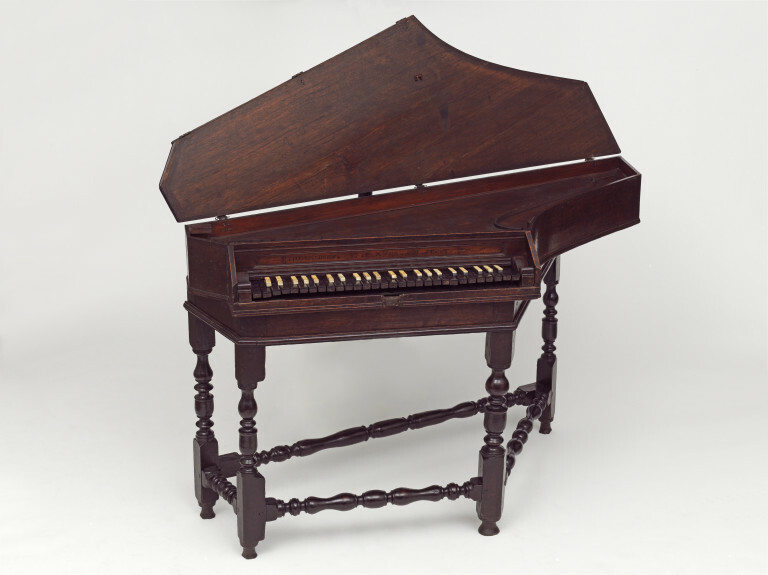 Whereas its predecessor, the virginal, was played on a table, the spinet was often set on a stand, like this example. The main advantage was that the spinet player could apply more even pressure to each key than the virginal player. The case is of oak, undecorated. What is probably the original stand, with four turned legs, is preserved with the instrument. The main hinges of the lid are of iron; those of the keyboard cover are of brass. The natural keys are of ebony with fronts that have originally been coated with some composition (perhaps gesso, with a relief pattern) and gilded. The accidentals are of ivory. The two lowest accidentals are divided into front and back parts: the front giving the note proper to short octave tuning (AA and BB) while the back was intended for the proper chromatic note. This keyboard is transitional, belonging to the period when the influence of a short-octave keyboard was still dominant, though the need for the low accidentals was asserting itself. This period extended in general terms from 1660 to 1710. The spinet is thought to have been given its wing shape in the 1630s by Girolamo Zenti, an Italian, who enjoyed royal patronage throughout Europe and was briefly employed by Charles II following the Restoration. John Player was a London builder, whose only dated instrument was made in 1664 and who would seem to have died in about 1705. An instrument recorded as being at Helmingham Hall could possibly have also been at Ham House. The split based sharps were characteristic of Player's instruments, described in a letter of 1712 as being with split or quarternotes. By John Player, London; Second half of the 17th century. The stand is probably original. 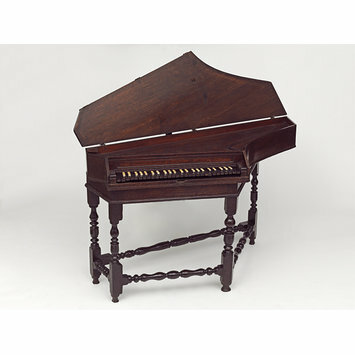 This is an early version of the typical English spinet of the 18th century with its wing-shaped asymmetrical case. Case of oak, soundboard possibly pine, naturals ebony and sharps covered with ivory. The instrument's range is fifty-one notes, GG - c3, with split D sharp and C sharp keys.